IOTA (MIOTA) is the only cryptocurrency meant for transactions between machines. It is designed on a directed acyclic graph (DAG) system. 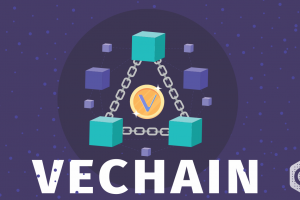 As the name suggests, the motive of this coin is to record all the transactions on the IoT (Internet of Things) platform. Non-profit organizations create it. The right to use the platform is available free of cost, and it offers ultimate scalability. Recently, IOTA (MIOTA) has been able to sign deals with some major multinational companies for their payment system. With a negative ROI (Return on Investment) of 51.90 %, IOTA (MIOTA) is the 15th largest crypto coin in the market. The total coins in circulation as of now stand at 2,779,530,283 MIOTA. The current market cap as on 17th April at 02:04 UTC stands at 866,735,595 USD. 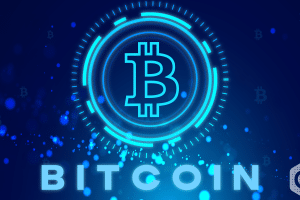 The value of each coin in terms of USD and BTC stand at 0.311828 USD and 0.00005972 BTC respectively. The current 24 h volume at the same UTC is 13,265,353 USD. 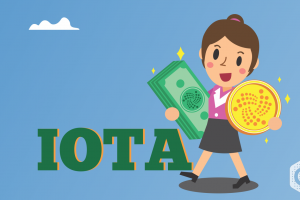 IOTA (MIOTA) had begun this year with a very high note when the price of each coin was hovering around 0.36 USD to 0.38 USD. But the momentum was lost in 2 weeks. It has grown inconsistently since then. 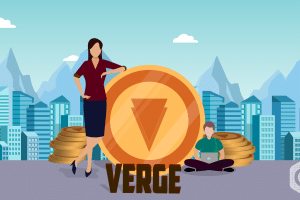 But along with the global crypto market, it gained handsomely after 1st April. 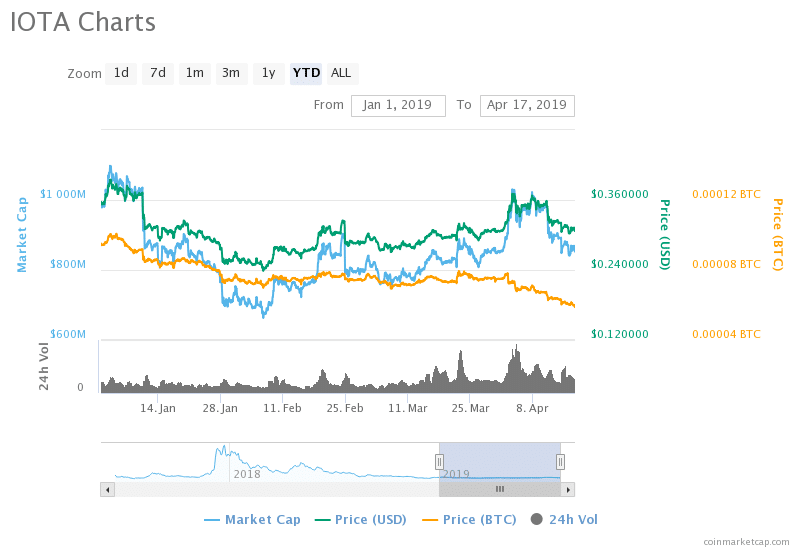 It was 0.37 USD per coin on April 3rd, and it is the second highest in 2019. But, contrary to popular expectations, it could not sustain the momentum and started falling down. 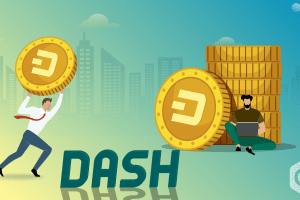 The market cap on 17th March was 834,462,707 USD, and the value of each coin in terms of USD and BTC were 0.300217 USD and 0.00007488 BTC. The current market cap is 3.86 % more than the market cap of the past month. The growth after April 1st was lost at the 0.37 USD resistance level. 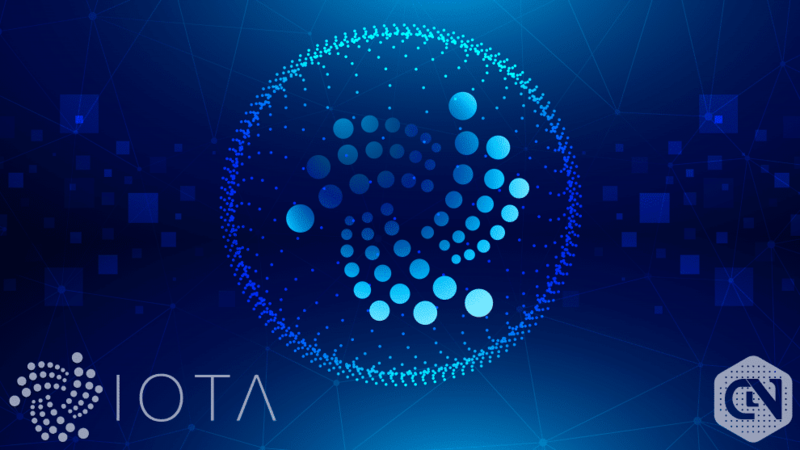 IOTA (MIOTA) is now roaming around 0.30 USD, and we predict the coin to move a little bit this week to face another resistance at 0.35 USD – 0.36 USD. This may be the last resistance before the coin reaches 0.4 USD level. As per our prediction, the coin should be at the 0.4 USD level by the end of this quarter. 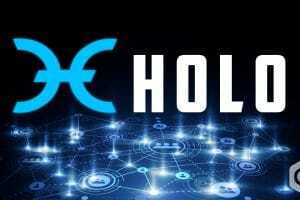 And by the end of 2019, it may reach as high as 5 USD, as the coin is now in talks for bigger partnerships in the global market. We advise the short term holders to wait for two weeks before selling their blocks. Long term holders will be benefitted by more than ten times if they stick to their positions. Stellar Lumens (XLM) Price Analysis: Is Stellar Done with the Downward Growth for Now?